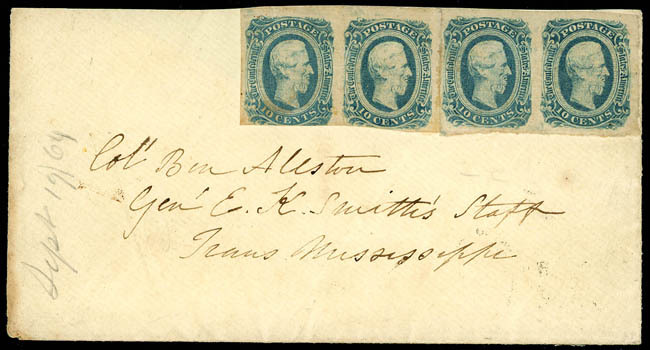 Confederacy, 1863, 10¢ blue, horizontal strip of four, folded and slightly separated at center, uncanceled on cover addressed to "Col. Ben Allston, Gen. E.K. Smith's Staff, Trans Mississippi" and carried by courier to departments headquarters in Shreveport, La., pencil "Sept 17/64" docketing at left; cover with partial backflap, Very Fine. Scott No. 12; $3,000 Estimate $750 - 1,000. A RARE TRANS-MISSISSIPPI USAGE BY COURIER TO THE INSPECTOR GENERAL OF THE TRANS-MISSISSIPPI DEPARTMENT. In January of 1863, Col. Ben Allston was transferred to the Trans-Mississippi department as inspector general for General Kirby Smith and continued in this capacity as well as chief of the secret service, until the surrender. 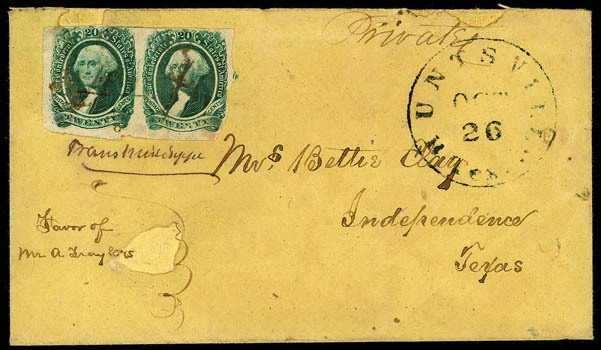 Confederacy, 1863, 20¢ green, horizontal pair, clear to large margins, uncanceled on cover sent by courier, addressed to "Col. Benj. Allston, Gen. Kirby Smith's Staff, Shreveport, Louisiana"; some cover edge soiling and missing most of backflap, F.-V.F. Scott No. 13; $3,000 Estimate $750 - 1,000. A RARE TRANS-MISSISSIPPI EXPRESS COURIER USAGE SENT TO THE INSPECTOR GENERAL OF THE TRANS-MISSISSIPPI DEPARTMENT. 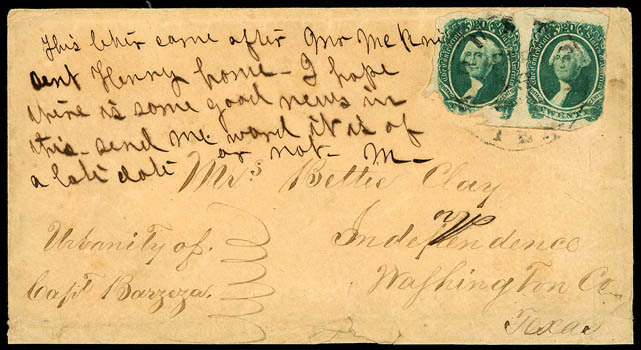 Confederacy, 1863, 20¢ green, horizontal pair, irregular margins with left stamp faulty at bottom, tied by "Houston, Tex., Sep 26" cds on cover to Independence, Texas from the Clay correspondence, with "Urbanity of Capt. Barzeza" endorsement and transit notation "This letter came after Mr. McKnight sent Henry home. I hope there is some good new in this. Send me word (or not) it is of a late date. M-"; cover missing bottomflap and small edge repair at bottom center, Fine, still a rare Trans-Mississippi courier express rate cover. Scott No. 13; $3,000 Estimate $500 - 750. It has been established that this letter originated in Mobile Ala. and was carried by Capt. Barzeza of the 5th Texas Brigade after his parole from Johnson Island prison in Ohio. 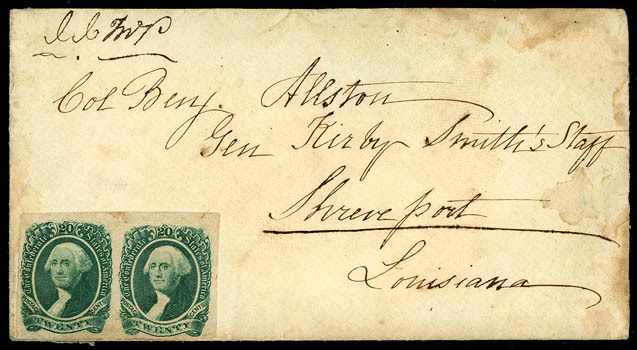 Confederacy, 1863, 20¢ green, horizontal pair, manuscript canceled on cover to Independence, Texas, with "Trans Mississippi" endorsement under postage, privately carried outside the postal system and entered the mails with "Huntsville, Tex., Oct 26" cds; left stamp and several cover holes repaired, Fine, still a rare Trans-Mississippi courier express rate usage to Texas; with 1978 C.S.A. certificate. Scott No. 13; $3,000 Estimate $400 - 600.